These two flavours go together so well you'll wonder why you haven't tried this combination before. If you have children at lunch, cut the cake in half and soak only one half in a couple of tablespoons of whisky. Preheat the oven to 180°C, gas mark 4. Grease and line a 22cm round spring-form cake tin with baking parchment. Melt the chocolate and butter in a pan over a very low heat. Stir in the eggs, caster sugar and pecans, if using, and mix well. Then fold in the flour until evenly blended. Pour the mixture into the tin, level the surface and bake on the middle shelf of the oven for 35 minutes until risen and set on top but still moist inside. To test, insert a knife or skewer into the centre - it should be slightly sticky when removed. Allow the cake to cool in the tin for about 15 minutes. Then remove from the tin and peel away the parchment. Transfer the cake to a plate and slowly pour over the whisky, allowing it to steep into the cake for at least 10 minutes or overnight. 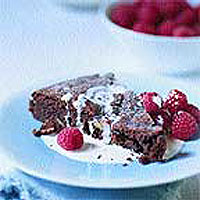 Dust with the icing sugar and serve with raspberries and cream.